I really want to listen to The Gilded Hour here at work. I wish I could. Happy reading! Good luck with The Poe Shadow! How much more have you got to go on it? As of last night, I’m within 50 pages. I should finish very soon! Happy reading. I admire your determination to finish The Poe Shadow so I’m going to wish for some amazing revelation in the final part of the book that will repay your investment in it! I have a major issue with the premise from the beginning so I’m not too hopeful. Happy reading! I find headphones or ear plugs helps me concentrate or sleep. I couldn’t read in cars for years, though. Happy reading! Enjoy your trip! I hope you get to do plenty of enjoyable reading on the flight. Thank you. My travel buddy and I are looking forward to reading by the pool! Happy reading! I found listening to audio books when home alone a bit creepy, but it’s possible choosing a book with brutal murders and evil spirits was maybe a bad idea 🙂 I think I’ll keep my audios for car journeys. Hope you enjoy your trip and your reads. Probably didn’t help anything to be sure! I had a bad time listening to Shirley Jackson at home and not hearing my husband walk up behind me. I think my scream startled the neighbors haha. Happy reading! That’s great to hear! I’m thinking of making it my vacation book. Happy reading! I haven’t read Before The Fall, and I haven’t checked who is the narrator, but my experience is that thrillers are usually even better as audiobooks. I’ve had good experiences both ways. Sometimes I read too fast and miss something key lol. Happy reading! Gilded hour has been a blessing while o slog through Poe. Happy reading! Glad I’m not alone. I did it while cooking dinner tonight. Happy reading! Reading can be so cozy it’s hard not to fall asleep sometimes. I really wanted to power further into the book I’m currently in the middle of the other night but I was so tired I couldn’t fight it. Happy reading! I have that problem reading on Sunday afternoons. Curled up in a sunny spot, my eyes start to close. Happy reading! I’ve still never really managed to get into audiobooks, I always just go for the paperback version usually!! 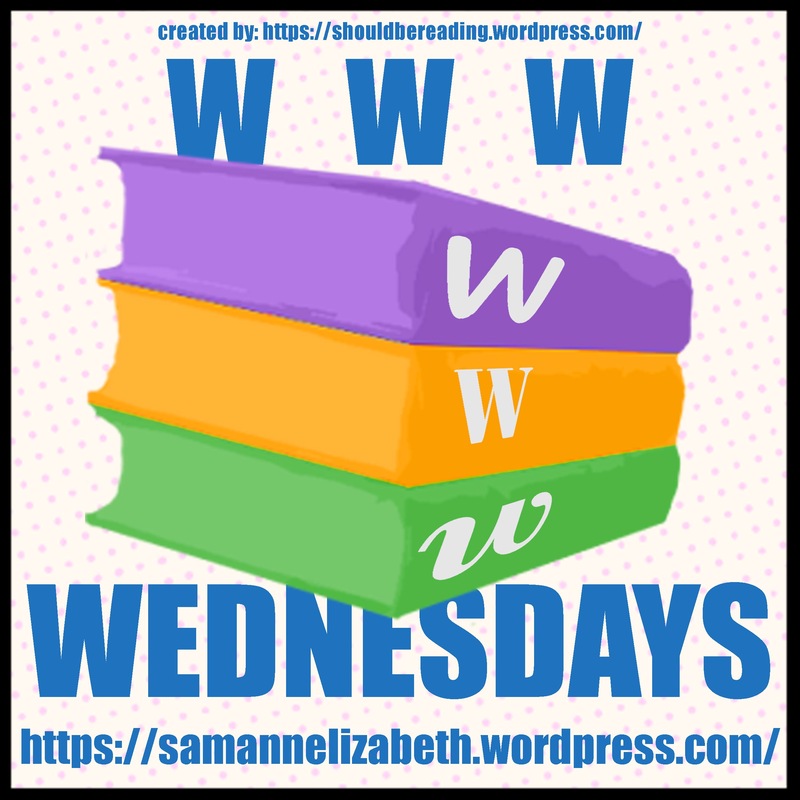 Here’s my WWW Wednesday post, been a while since I did one! They seem to be a ‘love or hate’ type of thing. Happy reading! I read like mad during Thanksgiving. It paid off. Lucky! I wish I’d gotten through more. Happy reading! I’m glad to see that I am not the only one who found their reading interrupted by Thanksgiving! I am absolutely stealing your audiobooks when alone idea. Maybe my house would get cleaner at the same time….. Here is my WWW: https://silverbuttonbooks.com/2018/11/28/www-wednesday-november-28-2018/. It does seem to help me stay focused while cleaning! It’s a nice perk. Happy reading! I tried it today and you are totally right! It does make cleaning (and folding the dratted laundry) better! I’m so determined to finish this weekend! Happy reading. Amen! Seems like I have time for it, too. The meeting is over a month away. Happy reading! Oooh! All of these books sound interesting! Hope you enjoy them all! How wonderful, welcome to our community! Happy Wednesday. Hey there! I’m new to WWW Wednesday 🙂 Love this idea! Before the Fall is one I’ve had an interest in, for a while. I look forward to your updates on it! Here’s the link to my WWW post. I’m hoping to start it soon after so many good reviews so far. Happy Wednesday! That sounds so lovely! I’ve told my husband that my ideal holiday celebration is Chinese take out, sweatpants, and a GoT marathon. Happy reading! I am looking forward to seeing what you think of Before the Fall, I was in the minority when I read it. My husband and I are thinking of listening to it while we drive to family Christmas. Happy reading!